Welcome to the Keene Valley Country Club! 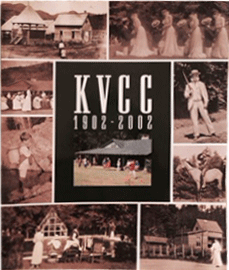 For the past 100+ years, the KVCC has been providing a summertime destination for relaxation, sport and community. Located in the heart of Keene Valley, NY (the “high peaks” region), the club sits on a 11-acre property on the banks of the Ausable River. In addition to the facilities (which include tennis courts, a pool, badminton/volleyball, a clubhouse and pro shop), the club provides a rich assortment of athletic and social activities. While the club is primarily a summer club, some facilities are available in the shoulder seasons and paddle tennis in the winter months. 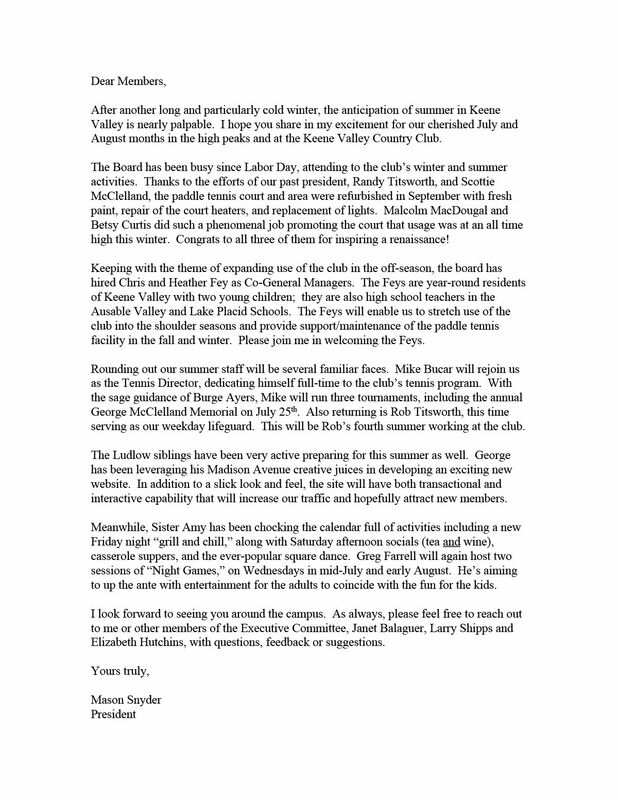 The summer season at the KVCC starts in the last week of June and ends on Labor Day. The KVCC non-profit corporation and is governed by a member-elected Board of Directors. As a non-profit, the fees for membership and activities are designed to be priced at the minimum needed to support operating costs, property maintenance and staff compensation. The KVCC always welcomes new members and offers a simple application process. Certain member levels also include discounts in the initial years of "associate" membership. See Member/Guest Info for details. 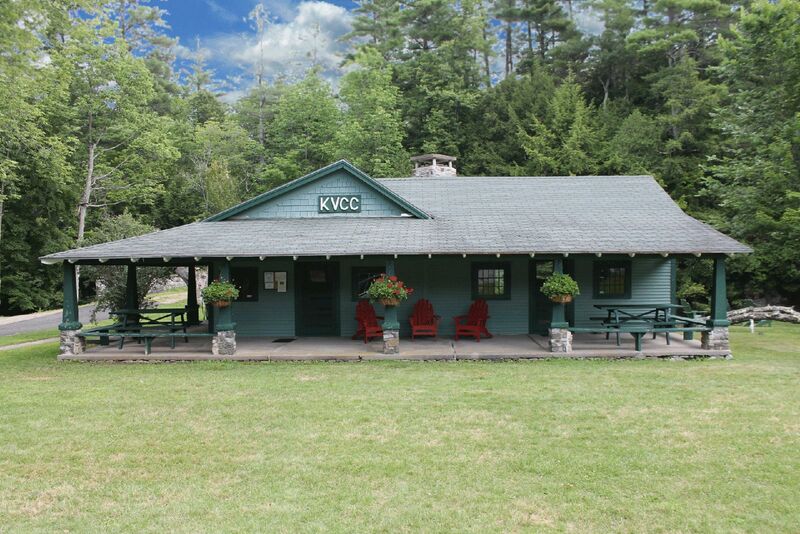 The KVCC campus is located in the heart of the village of Keene Valley NY and is situated on the banks of the Ausable River. 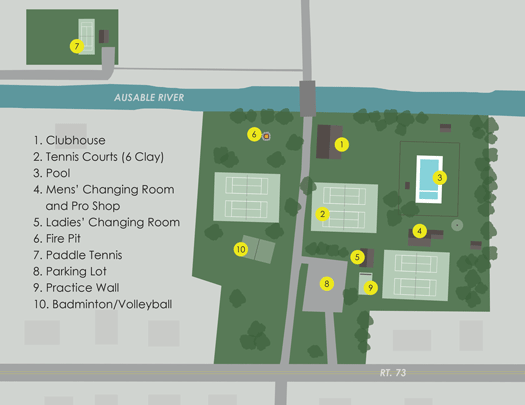 Please refer to the map below for an overview of the amenities and layout of the KVCC. 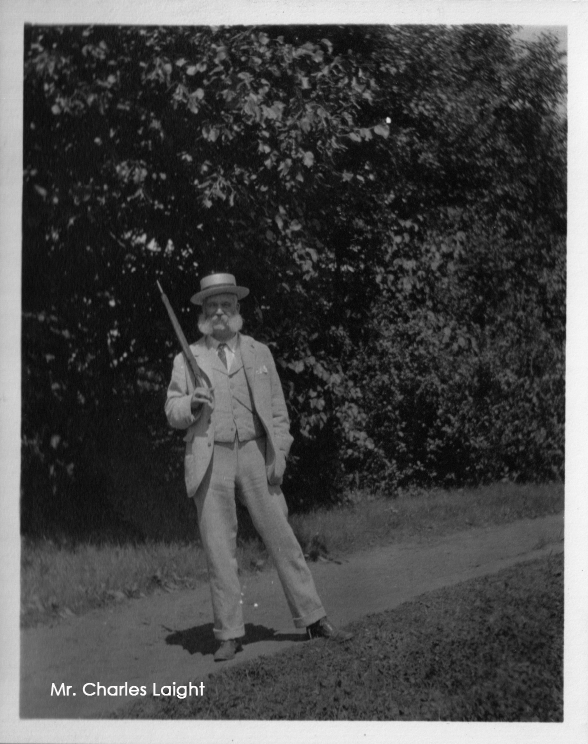 Even before the establishment of the Keene Valley Country Club, people had gathered at the property of George and Katharine Notman to play tennis, drink tea and talk. But in 1902, the KVCC was officially founded as a voluntary organization, sustained by the efforts and generosity of its members. 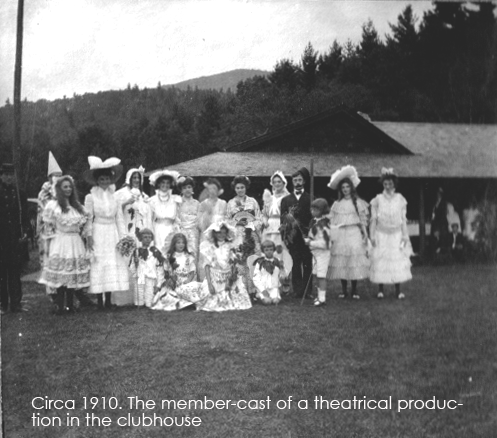 The Notmans allowed the club the use of their land, refurbished or moved buildings on the property for use of the membership, and subsidized the club’s operation. Existing cottages were joined to make a clubhouse; an old school house was reconstructed as the men’s locker room; a saloon was relocated for the use of the women. 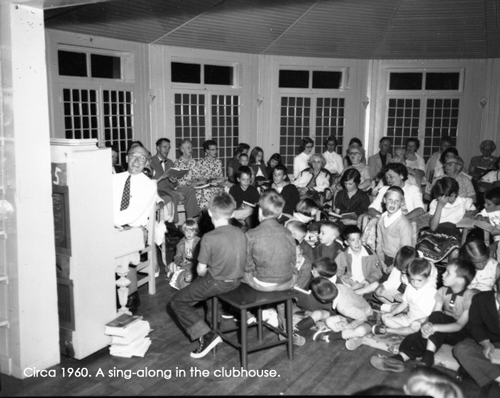 Keene Valley Country Club: One Hundred Summers By the River, 1902-2002. To see more historical photos, click here. For "extended" history, click here. The KVCC is governed by a 16-member Board of Directors, including an Executive Committee. The Keene Valley Country Club, Inc. (KVCC) was founded in 1902 (incorporated in 1923) by a group of summer residents on property donated by the Notman and Leighton families. 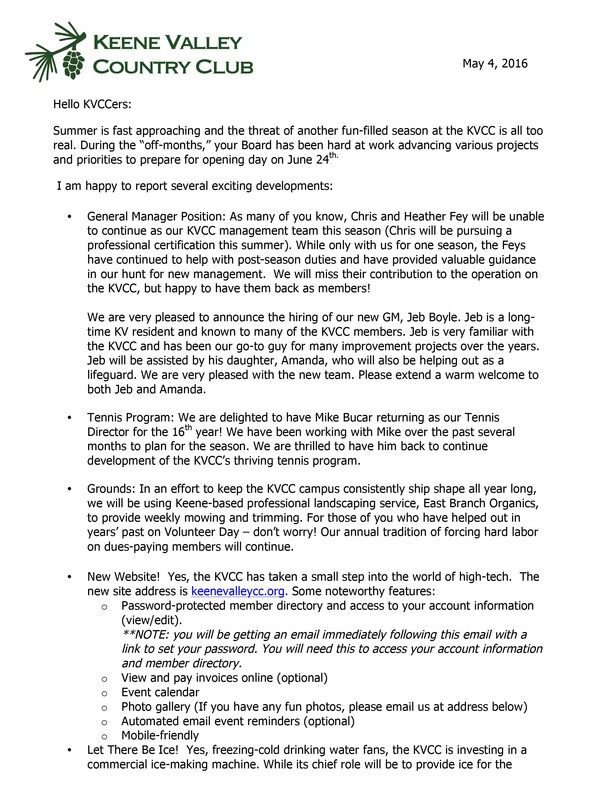 The KVCC purpose is to operate as a small informal and friendly club which encourages its members to share congenially in tennis, swimming and social activities from approximately July1 until Labor Day, and platform tennis during the winter. KVCC is a not-for-profit corporation. 1. Family Membership includes head of households, spouses or partners, and unmarried dependent children 25 or under. 2. Single Membership is for an adult of at least 21 years of age. 3. Social Membership is provided to members who no longer wish to use the athletic facilities of the KVCC yet wish to remain affiliated with the club. Social members do not have guest privileges or use of the KVCC facilities other than the clubhouse. They are invited to all KVCC functions - most notably the casserole suppers. 4. 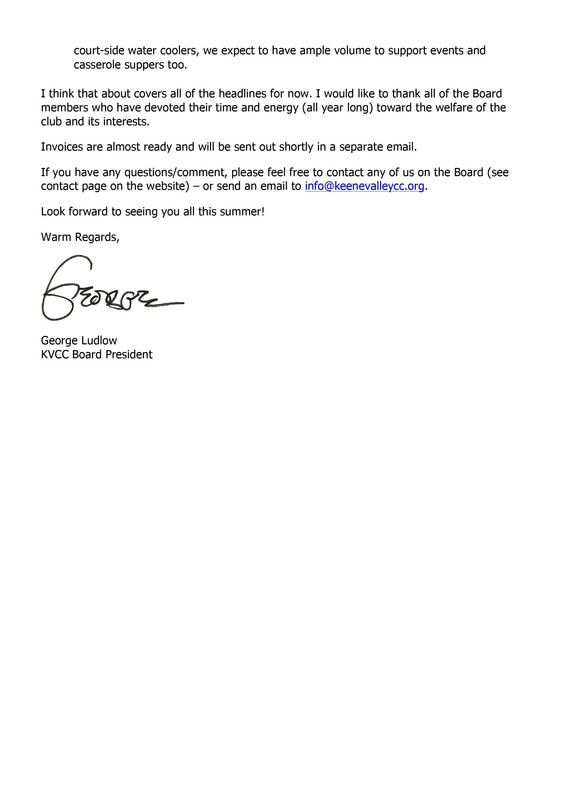 Honorary Membership - The board may vote honorary membership to those individuals who are recommended by the membership committee. Honorary Membership carries all membership privileges except the right to vote. These can be for lifetime or short term. 5. Associate Membership - Associate Members are new members who have not yet paid an initiation fee. An Associate Membership may only be held for two years whether consecutively or at an interval. Associate Members may bring guests to the KVCC but may not hold office or vote at the annual meeting. 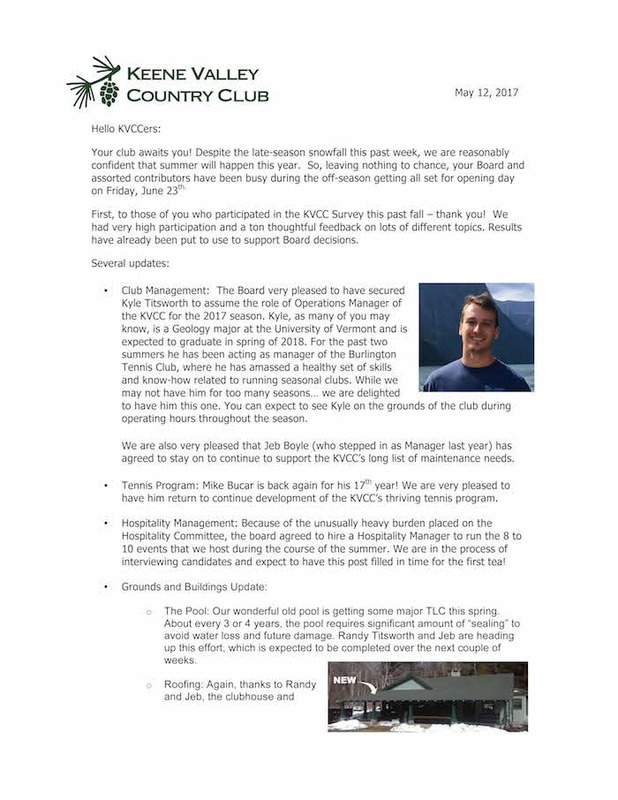 Normally after two years the membership committee will offer associate members active membership that will be granted after approval by the Board and payment of an initiation fee. Inactive membership is available to members who for various reasons will not be in the Valley for a given summer. Members wishing to become inactive must notify the membership committee chair before July 1st. Upon application to the membership chairperson, inactive members will be reinstated after paying a fee. Admission to membership shall be by the affirmative vote of a majority of the Board upon the recommendation of the Membership Committee. The Membership Committee, and the Board, in the consideration of individuals and families for membership, shall not discriminate on the basis of age, race, religion, gender, sexual orientation or national origin. Members shall be responsible for the conduct of their family members and guests. 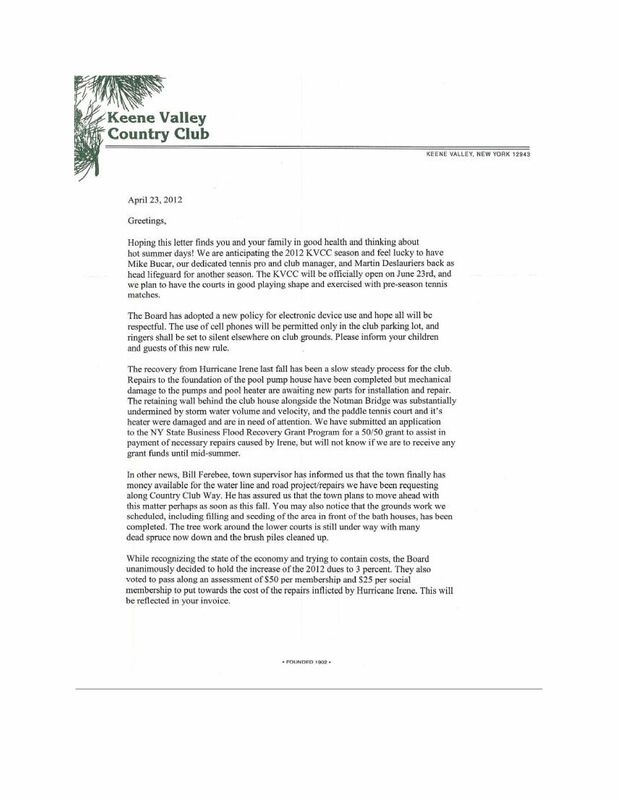 Any member who shall infringe the bylaws, rules, or regulations of the KVCC, conduct himself or herself in an unbecoming manner, or in a manner prejudicial to the welfare, interest, or character of the KVCC, or allow a family member or guest to do so, shall after written notice be subject to censure, or suspension from the use and privileges of the KVCC conditionally or for a fixed period, or to expulsion from membership, in each case by an affirmative vote of two-thirds of the members of the Board present at a meeting of the board. The President and the Club Manager are authorized to discipline members and family members and guests upon oral notice for such infractions with penalties which shall not exceed suspension from the use of the facilities of the KVCC for one week. The Manager shall immediately report any such infractions, and the imposition of any such penalties, to the President, who shall notify the Board as appropriate. Talking on cell phones, or any other personal electronic device, is prohibited on the KVCC campus, except for in the front parking lot area. Members/guests are permitted to use cell phones for "quiet activities," such as texting, email or reading. All electronic devices must be placed on "silent mode" while on campus, so that no ring-tones or alerts of any kind can be heard by others. 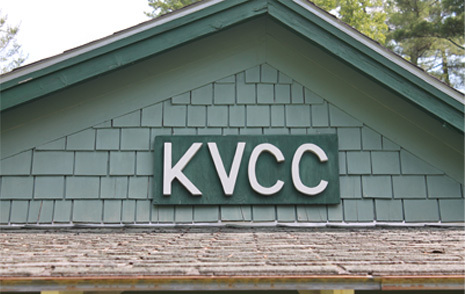 The annual meeting of the KVCC membership shall be held on the KVCC premises in August of each year on a date and an hour fixed and posted by the Board. 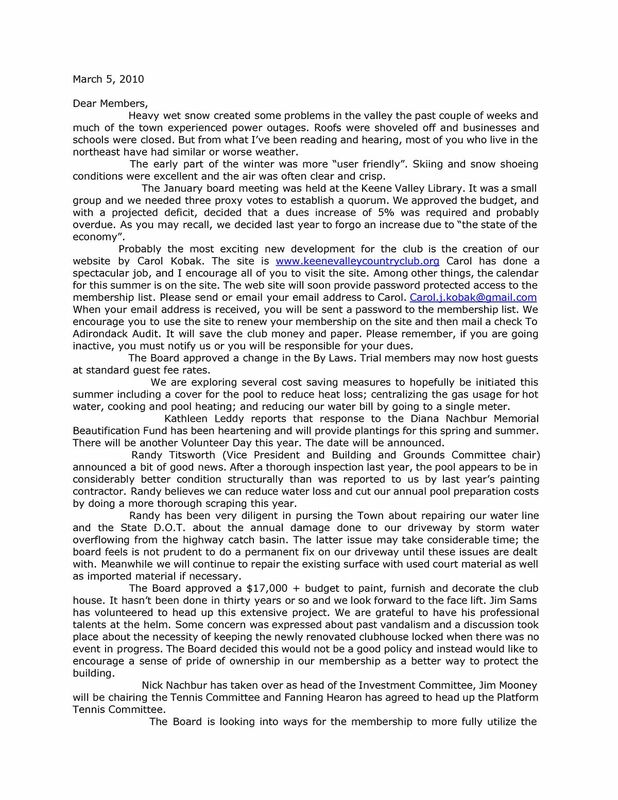 Special meetings of the KVCC membership my be called for specified purposes by the Board, and shall be called by the Secretary when directed by the Board, the President, or when requested in writing by ten (10) members of the Board. No business other than that for which it has been called shall be transacted at such special meeting. 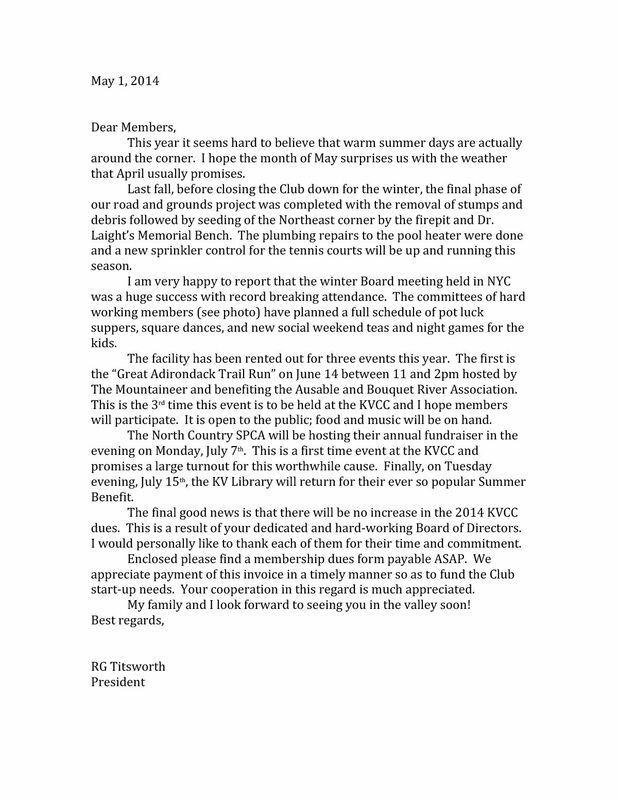 Written notice of the annual meeting and any special meeting of the KVCC membership shall be given to each membership by the Secretary by mailing such notice to an appropriate member at the last known address recorded for the membership on the KVCC books at least fifteen (15) days prior to the date set for the meeting. Notices of special meetings in all instances shall specifically state the objects and purposes of the meeting. Each membership shall be entitled to one vote, and except as otherwise specified in the bylaws, all matters shall be decided by a majority of the memberships present. Memberships shall be entitled to vote for directors, on any and all amendments to the bylaws proposed by the Board, and on such other matters as may be brought before the memberships by the Board of members as provided in the bylaws and upon appropriate notice. The KVCC Board shall be under the management of a Board of Directors. The Board shall consist of a minimum of twelve (12) and a maximum of eighteen (18) directors who shall serve three year staggered terms. At each annual meeting the membership shall elect directors from among the membership to serve for a term of three years in place of the directors whose terms are expiring. Directors may succeed themselves, but no director who has served a total of six consecutive years shall be eligible for reelection for at least one year. The Board shall establish all rules and regulations pertaining to conduct on the KVCC properties. Any vacancy occurring on the Board may be filled for the unexpired term by a majority vote of the remaining members of the Board. If any director fails within a single year to attend two of three regular meetings of the Board without good cause, the Board may declare the seat vacant. The Board shall meet at reasonable intervals, but not less than three times each year, at times and places specified by the Board. A majority of the members of the Board shall constitute a quorum at any meeting. 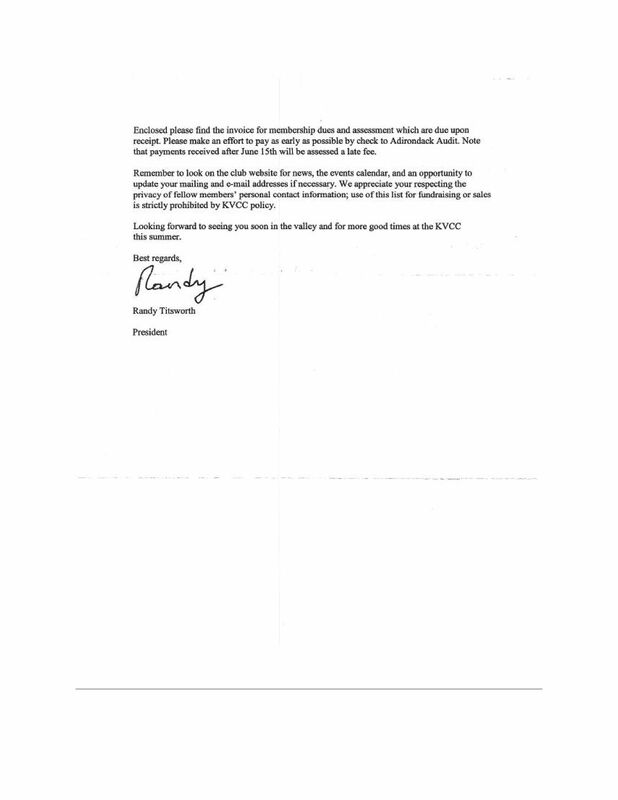 All directors shall sign a letter confirming that their service to KVCC is free of any conflict of interest. The officers of the KVCC shall be a President, a Vice President, a Secretary, a Treasurer, and, at the discretion of the Board, an Assistant Secretary and an Assistant Treasurer. Officers shall be elected each year from among the directors for one year terms by the Board at its first meeting following the annual meeting of the KVCC membership. Officers may be reelected for as long as they serve as directors on the Board. The President shall be the chief executive officer of the KVCC and shall have authority and responsibility for the general supervision of its business and operations, subject to the control of the Board. The President shall preside at all meetings of the Board and of the membership. The Vice President shall assume the duties and responsibilities of the President in the absence or disability of the President. The Vice President shall also perform such duties as shall be assigned by the President or the Board. The Secretary shall keep a record of the meetings of the Board and the membership. the Secretary shall be responsible for the notice of meetings, and shall provide for appropriate custody of all records and reports. The Secretary shall be custodian of the seal of the Corporation and shall cause it to be affixed to all documents executed on behalf of the KVCC. The Secretary shall maintain a current list of the membership, and shall provide for appropriate notification of admissions to membership. The Treasurer shall keep the accounts, shall have charge of all funds, and shall provide appropriate custody of all securities of the KVCC. The Treasurer shall collect all annual dues, initiation fees, and all other indebtedness of the members, and provide for the collections of all guest and use fees. The Treasurer shall make, and shall cause to be made, payments to discharge the financial obligations of the KVCC upon budgets and as directed by the Board; and shall render periodic and annual statements of accounts and balance sheets to the membership and as the Board shall direct. The Treasurer shall supervise any accountant retained by the Board. The Investment Committee of the Board as appointed by the President will report to the Treasurer. In the absence or disability of the Secretary or the Treasurer the Assistant Officer shall assume the duties and responsibilities of the Office. The Board may retain a Club Manager, who shall perform such duties and assume such responsibilities as shall be assigned from time to time by the Board upon the advice of the officers, and who shall report to the President, as appropriate, and to the Board. The Board may retain a Tennis Director, who will report to the Tennis Committee Chairperson. The Tennis Director shall be responsible for conducting the club’s tennis program, as outlined in his/her annual contract. 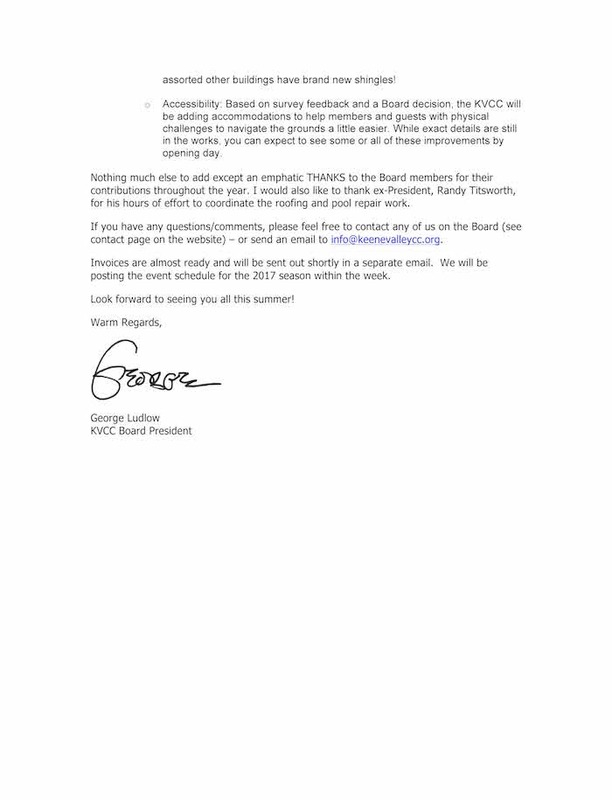 The Board may elect an Advisory Council, which shall consist of members and family members who in the past have rendered significant service to the KVCC as officers of directors, or who the Board determines can otherwise advise and assist the Board in the fulfillment of its responsibilities. Members of the Advisory Council, upon recommendation by the Nominating Committee, shall be elected for a three year term by the Board at its first meeting following the Annual Meeting. Members of the Advisory Council shall receive minutes and notices of Board meetings, and may attend and participate in such meetings, but shall have no vote. The Board shall retain an accountant who periodically, under supervision of the Treasurer, shall be responsible to the Board, and shall prepare necessary audits, and financial statements, and shall otherwise report concerning the financial condition of the KVCC, as the Board shall direct. 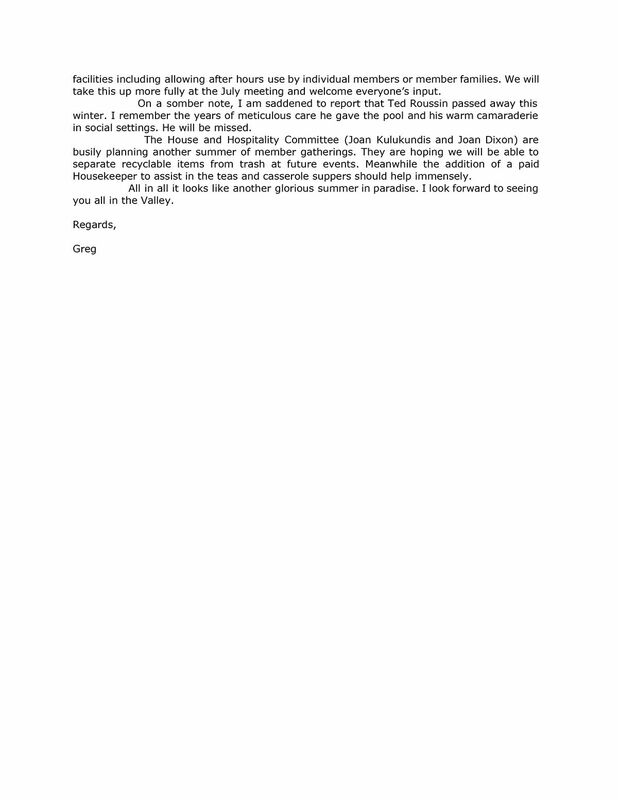 The Board may establish, and may authorize the President to establish, standing committees and special committees. The President shall appoint the chair and the members of each such committee. Such committees shall be composed of KVCC members, and shall have such duties and responsibilities as the Board from time to time shall specify. The chair of each such committee, subject tot he general approval of the Board and the President, may recommend and recruit members of the committee, and organize and schedule committee activities, No committees shall act on behalf of the KVCC without prior express authorization by the Board. Responsibility for Membership, Nominating, Development, Finance and Investment, Hospitality and House, Buildings and Grounds, Pool, Tennis and Platform Tennis shall be assigned to standing committees. On or before the July Board Meeting, the President shall appoint a Nominating Committee composed of three (3) directors. As appropriate, the committee shall appoint candidates for the Board, for officers, and for the Advisory Council. Nominations shall be made each year by the Nominating Committee at least ten days prior to the annual meeting. The Secretary shall cause such nominations to be posted promptly and prominently on the KVCC premises. The Nomination Committee shall also recommend candidates for appointment to the Advisory Council by the Board, as appropriate. The Board shall fix the Club dues, initiation fees, and other charges to memberships, including fees for guest privileges for swimming, tennis, or other activities, and manner of payment. All dues, fees, and other charges shall be paid within thirty days after date of invoices. The Board shall take such action with respect to delinquent indebtedness as it shall deem appropriate, including, after written notice, suspension of the appropriate membership from the use and privileges of membership conditionally or for a fixed period, or, by an affirmative vote of two-thirds of the members of the Board present at a meeting of the Board, expulsion from membership. These bylaws may be amended or repealed, in whole or in part, by the affirmative vote of two-thirds of the membership present at any annual meeting or special meeting called for that purpose, provided that the proposed changes are posted prominently on the KVCC premises and are mailed to the memberships at least thirty days prior to the annual meeting or special meeting for that purpose. A failure to adhere to any time requirement specified by these bylaws, shall not, in and or itself, invalidate any affected action, provided that there is an affirmative waiver or approval of the affected action by a majority vote at a meeting of the membership or the Board, as appropriate, within a reasonable time.